Are you a developer that plans to submit new apps or updates to the Apple App Store in the new year? If so, you’ll need to be aware of some changes with Apple’s policies. The good news is compliance is easy as you just have to take a few steps to make sure you’re ready. To help you navigate this, following is everything you need to know. Introduced as part of iOS 9 in 2015, ATS is a security feature designed to improve user privacy and data integrity. 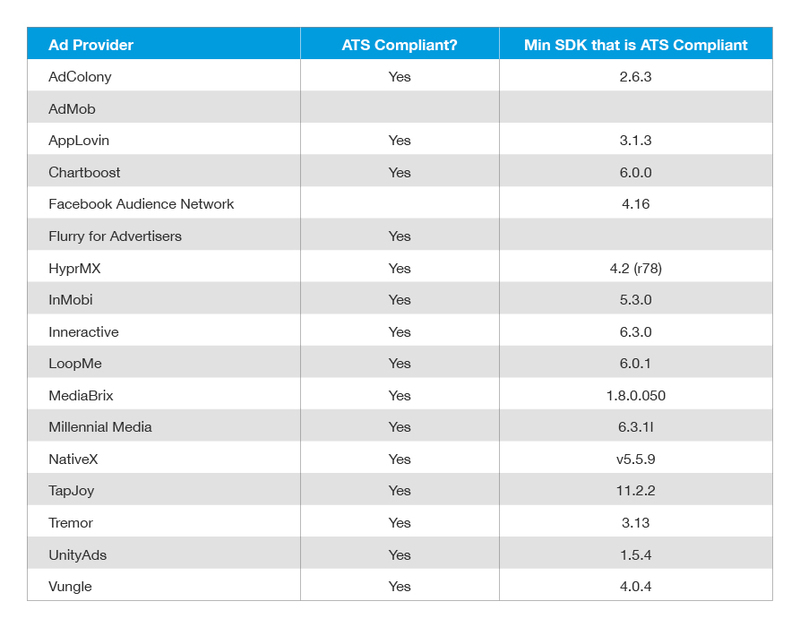 ATS requires apps to connect over HTTPS, instead of HTTP, in order to keep client-server communications and user data secure with encryption. This change helps instill user confidence that their apps won’t accidentally leak user data. Please note that ATS is enabled by default on Apple platforms. Any version of your apps currently available in the App Store will likely not be affected by the new measures. However, once you are ready to submit an update or a new app to the Store, you must make sure that your code is fully compliant with ATS requirements. Your app should be compliant as long as your project is built with either the iOS 9 or iOS 10 based SDK. Also, if you have any ATS exceptions listed in the info.plist, Apple requires “Reasonable Justification” to be provided at time of submission. How is Fyber ensuring ATS compatibility? Fyber’s infrastructure is already fully ATS compliant. The Fyber SDK (7.2.0 and above) enforce that all requests from the client are made via HTTPS. Also, our servers use security certificates that match Apple’s standards. Simultaneously, our demand teams are ensuring that only campaigns that can support HTTPS make it onto the Fyber Exchange. If you have any further questions regarding ATS please contact your account manager, email [email protected], or see this detailed article.